Faces Ultime Pro Starry Matte Lip Crayon Sinful 02 - Yum! Home ReviewsBeauty Faces Ultime Pro Starry Matte Lip Crayon Sinful 02 – Yum! Faces Ultime Pro Starry Matte Lip Crayon Sinful 02 – Yum! Who is it for? Faces Ultime Pro Starry Matte Lip Crayon Sinful 02 Is For those looking for a bold shade that is highly pigmented and has a shimmery effect. It will also work well for those looking out for bridal shades. The lip crayon comes in a color coded body which makes it easy to identify the shade. However, the cap does tend it come off, which is a bit of a problem when traveling. It also comes with a free sharpener which is good. The crayon glides onto the lips very smoothly. But due to the glitter in the product, it does feel a little gritty on the lips and then gets a little annoying. The finish is super matte. Sinful 02 is a shade between a glittery oxblood and a deep wine red. It’s not a shade that can be pulled off by everyone. If you prefer subtle, this isn’t the one as it is very bold. It has some glitter in it that is very subtle and not blind, so that’s good. It will suit most Indian skin tones and can work as a great bridal shade too. The pigmentation of the product is amazing. One swipe of it onto the lips is more than enough. It gives that instant pop. The pigmentation is so strong that taking it off becomes a bit of a problem. It requires a really strong cleanser to take it off completely. 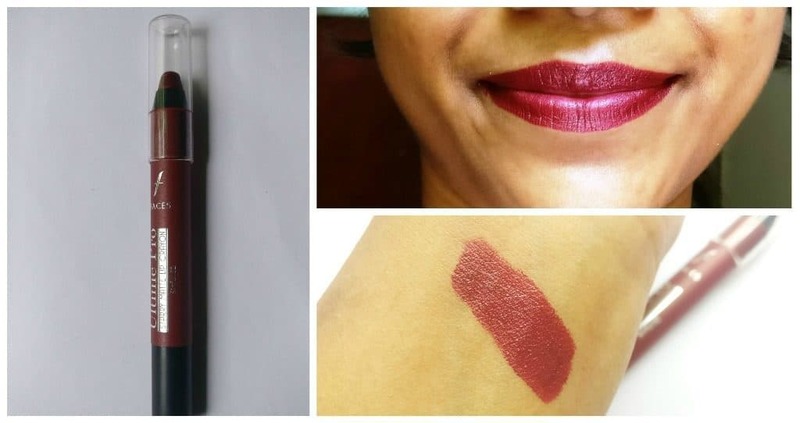 The lip shade lasts for a good 7 hours but it does lose its intensity with time. It stays quite well through drinking and meals but does fade a bit around the center of the lips. What did I like about This? If you’re looking for a shade like this one with good pigmentation and shimmer, I’d definitely recommend it. Faces Canada Glam on Color Perfect Lipstick Roseate, Sugar Candy and Fallen for Kiss Reviews and Swatches!! Antonio Banderas Her Golden Secret – Sweet and Sensual! Shimmer is not my thing but the shade is great..